Happy 2014! The new year is a time of resolutions, a fresh start. Don't eat this, exercise more, save more. I am terrible at New Year's resolutions. Even when I think of something to resolve, I don't write it down or do anything to move myself toward my resolution. While perusing Pinterest one day over the holiday, it dawned on me where I fail. I never make a resolution + action plan. I just say, I am going to exercise more and hope my will power kicks in before I fail completely. FYI, will power is not reliable. The "pin" on Pinterest literally said, resolve for a cleaner house, which is one of my greatest downfalls. I hate cleaning. I painted my kitchen and bathroom over the holiday and discovered the dustiest, grossest baseboards in the world. I was horrified. The pinner's secret to success was all about her daily maintenance action plan. She made a list of all of the chores that needed to happen - mop floor, vacuum hall, clean toilet, clean shower - and assigned them to a day. Laminated the list so she could check off each day the chore she completed. Viola, a plan! So far it is working. Instead of having one giant chore day, that can be forever and ever pushed off based on better things to do, if I tackle one or two small chores each day I build out a habit. And my inner school-girl loves checking boxes. Just like resolving for daily house maintenance, it is just as important as caregivers to resolve for daily self maintenance. But, we can't skip the most important part of our resolution, the action plan. What are the things you plan to do daily to care for your self? Monday spend 30 minutes on your favorite hobby; Tuesday cook your favorite meal; Wednesday exercise for 45 minutes to 1 hour; Thursday sleep in; Friday date night with yourself - go to dinner and a movie or catch up with friends; Saturday give yourself a manicure, hair treatment or masque; Sunday attend church or make a traditional Sunday brunch. And we can't forget about adding monthly activities to our action plan, like attending a support group. When we spend just 30 minutes to an hour on ourselves each day, filling our cup back up we can manage the stress of our caregiving duties better and keep ourselves happier. Just like chore day, we can alwasy come up with a reason to put it off. Resolve to keep your cup full everyday. PLEASE READ & SHARE: The temperatures are predicted to be dangerously low this week, meaning we have to be extra vigilant when caring for someone with Alzheimer's or dementia. Specially those loved ones in the middle stages of the disease who may not be able to communicate their wants and feelings. Think about how this weather makes you feel: anxious, frightened, bored from being indoors? Think about common activities during this kind of weather, was your husband the one that always shoveled the driveway? That might be the reason why he is itching to get outside. Here are some tips when caring for someone with Alzheimer's or dementia during extreme weather. It is imperative during these low temperatures to prevent wandering, period. And, more importantly to have our action plan in place in the event your loved one does wander. Need activities to do while you are stuck inside on this snowy day? Call our office, we are available 24/7 and have a plethora of activities designed for any stage of dementia. Check out our safety center at alz.org/safety for more information about safety and Alzheimer's. For more information about these workshops call, 800.272.3900. To see our entire listing of workshops and activities click here! Cheese may be the greatest invention, ever. And is a go-to party staple, especially during the holidays. I love baked brie, but it can sometimes be cumbersome especially if you are headed to someone else's home. Our Special Events Coordinator, Kim, offered this great recipe - then I added my own twist. 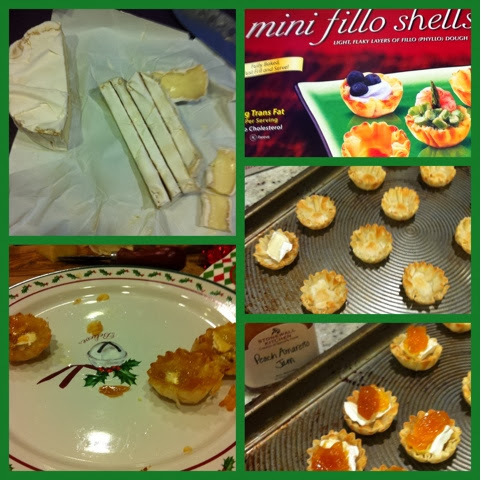 The great thing about these brie bites, you can add anything you want on top, from savory to sweet. Pre-heat the oven to 350 degrees. Cut the brie into bite size pieces and place in a phyllo cup, add the preserves on top. I love the peach amaretto! Bake for 8-10 minutes until the brie is bubbling. Watch them disappear!